We do not require you to be a member of the church, and we allow guest pastors. 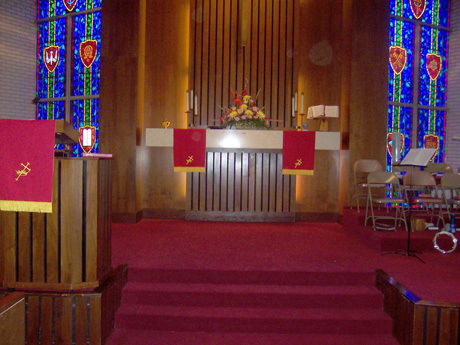 For your service, you may choose the Chapel which can seat 30-50 guests for a fee of $250 or the Sanctuary which can seat 325 for a fee of $750. 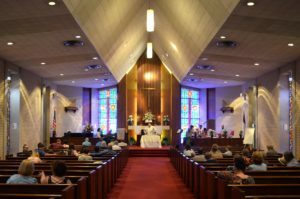 In the Sanctuary, we have a brand new Hammond organ, a Kawai digital keyboard, an acoustic grand piano and a state-of-the-art BOSE sound system. In the Chapel, we have a keyboard available. Artists are available for an extra fee to play these instruments, if needed. 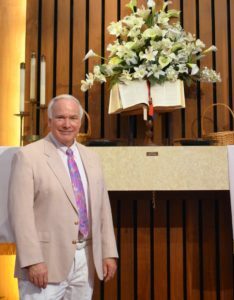 Pastor Fielland’s services are available to perform your wedding ceremony, conduct a couple’s consultation and oversee a rehearsal which is scheduled on the day before your wedding. A Photographer is also available at an extra fee. For your reception, our Parish Hall and brand-new stainless steel kitchen may also be rented for $250. For any of these rentals, we charge a $250 refundable fee to cover any necessary cleaning or repairs. We hope we can be a part of your special day! And, of course, you are always welcome to join us during worship on Sundays at 11:00 A.M. Please call (813) 787-8172 or email fielland@hotmail.com for additional information. This Google map will show you the correct placement for our church office, social hall, classrooms, and the Historical Chapel, all at 210 Inverness Avenue. The main building or Sanctuary for our Sunday worship services is one block north of the office at 212 Inverness Avenue.